A good written definition of a Project should be produced as soon as possible to ensure you have understood the project brief correctly and can agree with the owners of the Project that you know where you are heading and are set up for success. 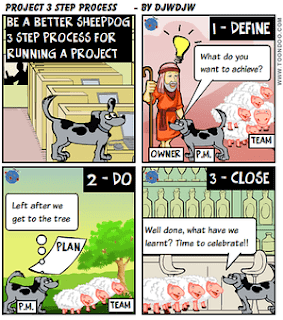 This post is a check-list of what I would expect to see in a document whether that be a Project Initiation Document (PID) in the PRINCE2 world or Project Management Plan (PMP) in the Project Management Professional world. Note that in the check-list below I have used PRINCE2 terminology e.g. the document is referred to as PID. Project Team Organisation. Identify external suppliers. The definition should be clear about how the project owners will judge success delivered by the Project team. This is covered in a different post. The Project Definition is the contract between the Project Manager and the Project Owner. It is important to establish as early as possible in the project life-cycle to give a stable foundation for execution of the Project. It will be used to judge one dimension of project success. 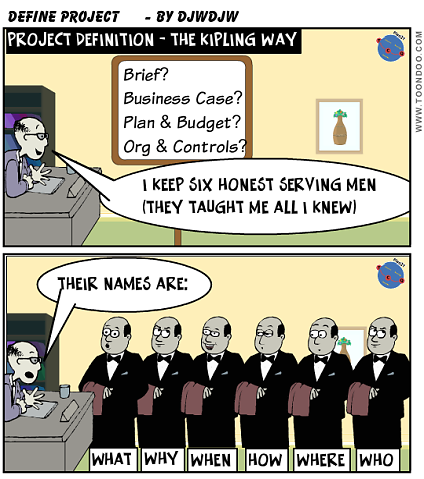 So if you can't find six honest serving men, take these roles yourself and get defining!